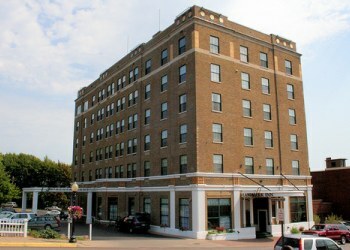 The Northland Hotel was first conceived around 1910. The foundation was started in 1917, but the hotel itself did not open until January 8, 1930. It operated as a full service hotel with over 100 rooms until the 1970's. Because previous owners had not updated the hotel over the years, it fell into disrepair, and closed in 1982. Amelia Earhart stayed in room 502 in 1932. The Landmark Inn rooms were numbered, based on the actual room she stayed in. We have named the room, THE AMELIA EARHART ROOM. Abbot and Costello, the famous comedians, came to Marquette during the war in 1942, to perform for the American Legion. We have an ABBOT AND COSTELLO ROOM. Well known musicians, Duke Ellington and Louis Armstrong, and the singing group Peter, Paul, and Mary stayed in the Hotel Northland. In 1995 a major renovation and restoration project started. Everything in the hotel has been refurbished or replaced, from floors to ceilings. The task was undertaken by TEAM LANDMARK a company specializing in historic restoration. As with many old buildings whose history spans a century, we have heard rumors from hotel guests and employees of strange happenings - perhaps ghosts? There have been official visitors to the Landmark who have used interesting equipment and camped out all night to search for these mysterious spirits. Those visitors are the Northern Michigan University Paranormal Society, the Upper Peninsula Paranormal Society and the Southeastern Michigan Paranormal. The Landmark Inn is featured in a new Ghost Hunter's book. During the 1930's when the Northland Hotel (Landmark) opened, it was the social and cultural center of town. Downtown Marquette was considered a larger town in the Northern Midwest where many in remote outposts came for supplies. An Ore boat's arrival was a major event bringing a crew to enjoy shore leave before the ship sailed again, full of iron ore.
One crew member was a regular visitor to the town library and caught the eye of the spinster librarian. Being 30 and unwed was a hopeless situation for a women in that day, but hopes revived as the librarian fell in love with the visitor. Her love was returned and the two decided to make Marquette their home. The crewman left for his final cruise on the big lake. He would collect his pay and return to marry his love. As fortune would dictate, the ship met with one of the infamous Superior storms and was swept away taking the crew to a cold wet grave. The librarian never recovered, she couldn't work or eat and soon died from her broken heart. It is said that she looks out from the Lilac Room on the 6th floor and waits for her love to return. The Northland Hotel (Landmark) was built to house visitors from Boston and New York who came to oversee their mineral and lumber interests. Marquette was a bustling remote town offering all of the pleasures and amenities of the day. During the building of the hotel there were many starts and stops in the project over financing. Interests changed hands over and over and it was said those negotiations took place in the partially built hotel. The parties walked through the unfinished halls enjoying good whiskey and the company of lovely ladies. One of the most sought after woman escorts was involved in a bit of pillow talk to the favor of one of the negotiating parties. The other man discovered her deceit while inebriated and killed the woman in a rage. To hide his crime, the man buried her in a yet unfinished portion of the hotel's basement. It is said that she calls for the workmen to stop building, to find her and her untold secrets. Since the hotel was completely renovated and reopened in 1997, the Lilac room has experienced bizarre phenomenon from the first night it was rented. The first guest, a gentleman, reported he had turned down the bed to find screws between the sheets. The front desk apologized and offered to have housekeeping change the sheets. The man left for dinner and housekeeping changed the sheet and a supervisor checked them carefully. Upon his return the gentleman once again found screws in his sheets. He was moved to another room. Many times front desk agents have reported the phone ringing to the front desk when the Lilac room is not rented. They answer, but no one is there. Men often have trouble with their keys in the Lilac room. Gentlemen will return to the front desk for a new key and often an agent will have to accompany them to open the door. The paranormal teams that have stayed in the Lilac room to test for spirits have had varying reports. The Southeastern Michigan group, reported some activity, but non-conclusive results. The NMU Paranormal group also used a medium and took pictures of a small white ball of light. The medium reported both a woman and 2 men. They said the woman's name was Mary Eleanor and she was searching for her dog. The two men were angry and refused to speak to the medium. Since 2003 there has been a marked decline in staff or guest reports of paranormal or unexplained circumstance in the Lilac room. One of our Bartender's, Debbie, reported a very interesting conversation with a guest in 2002. The guest was expressing appreciation for the restoration of the hotel. She reminisced about a spooky experience she had had in the 'old' hotel. The 6th floor restaurant for many years was called the Crow's Nest and was very popular. The woman recalled a visit to the Crow's Nest and as she was dining with her husband noticing another woman standing at the bar. Her attention was drawn to the other woman because her skirt was being pulled out. "It was like someone had pulled out the skirt to examine the fabric, but no one was there". She thought she might have imagined it so she had her husband look and once again it happened. Debbie told the visitor of the reports of ghosts in the hotel and the woman said, "I always thought so, to this day I still remember the skirt, covered with lilacs". The bartender startled and told her about the stories of the Lilac room. The woman got so shook up that she felt ill and had to leave. Another Bartender, Rachael, was closing down and sitting on the guest side of the bar finishing her nightly paperwork. Her eye caught movement and she looked up to see a red wine glass slowly slide from the hanging display unit and crash to the bar back. Rachael reported being frozen to stare at the second glass being pushed forward and break on to the bar. She ran out locking the door and leaving the mess to be cleaned up the next day. Various guests have told of feelings of being followed or watched as they walk down the halls late at night. We have no explanation for these events, but we are convinced that if there are spirits, they are harmless and just a bit mischievous.